Do you run a business or service that requires appointment scheduling? If so, then you’re already fully aware of what’s involved. A lot of time is wasted between email and phone call scheduling not to mention the appointment reminders. 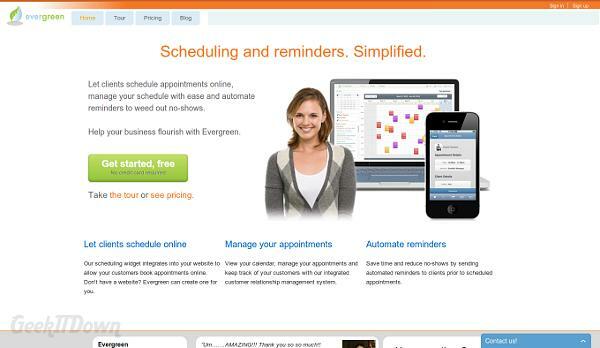 Evergreen is appointment scheduling software developed to save time and automate the tasks involved with scheduling. For most, a website is an integral part of their business and in some ways an extension for their products and services. 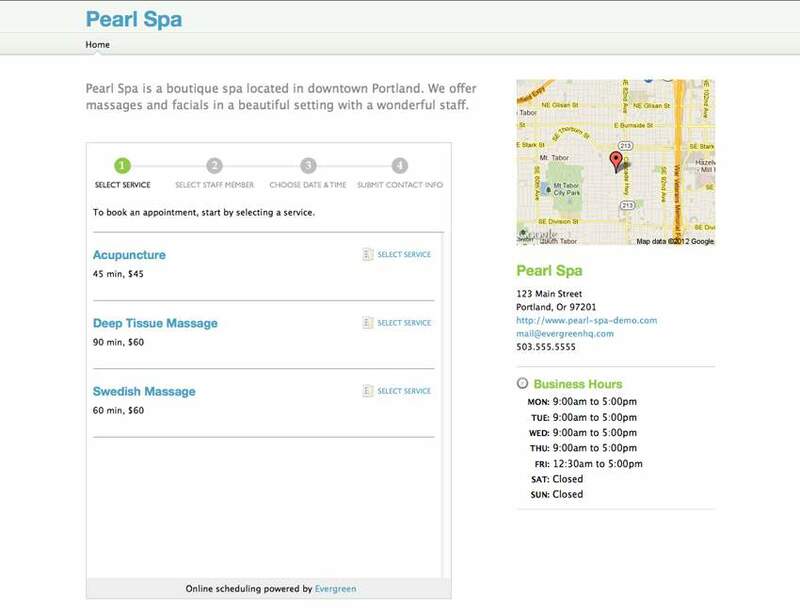 With Evergreen companies can incorporate appointment scheduling directly into their website. Customers can schedule online from anywhere and save both parties time. The scheduling information can display employee schedules and availability as well as block time out so that scheduling isn’t an option. Through traditional operating hours and manipulation of schedules, companies can guide customers towards openings and encourage them to schedule immediately while they’re on the website. Obviously time is a huge benefit to using Evergreen. Initially, users will need to setup the Evergreen system with basic company information and afterwards scheduling is, for the most part, automated. Convenience is another big advantage to using Evergreen with your business. Customers want easy, immediate, accurate service. 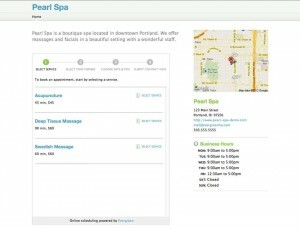 It doesn’t get much more convenient than scheduling an appointment online at a time of your own choosing. Customers will likely embrace the online scheduling option and be more inclined to make an appointment with the option in front of them. A huge time waster is reminding customers of an upcoming appointment. Evergreen handles that with automated reminders via email along with appointment notifications via text message and email to staff. We’ve touched on a few features already, such as the automated reminders and integration with existing website. Other features worth noting include SSL encryption to keep data safe, widgets and buttons for call to action purposes, customer database and profiles along with a host of other features that expand on the service. Evergreen could be a truly beneficial service and application for those who set appointments regularly. Some freelancers may have trouble relying on Evergreen since appointments are more fluid by nature than say, a massage parlor for example. Evergreen is versatile and developed to provide as wide an availability as possible with additional integration directly from Facebook pages via a widget. 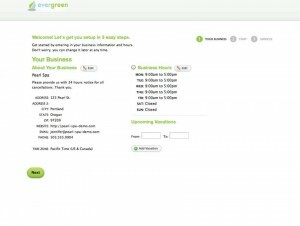 Solo users can start using Evergreen right away for $24/month while larger organizations have additional account options. 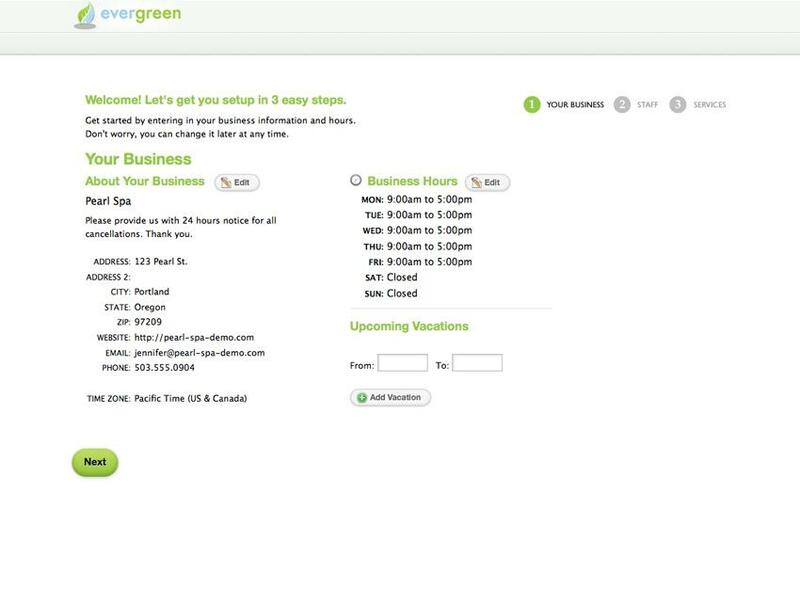 The Evergreen software service is a utility that many small businesses can benefit from and should be using to save manpower and labor costs as well as draw in potential clients who prefer using the web to schedule and make appointments.